*Class locations are subject to change. Announcements will be made via email. Inspired by Charles and Ray Eames’ canonical Powers of Ten, the course explores the relationship between science and engineering through the lens of Design. It examines how transformations in science and technology have influenced design thinking, and vice versa. It offers interdisciplinary tools and methods to represent, model, design and fabricate objects, machines, and systems. Structured as core lectures and charrette sessions, the course is organized by “systems”: Design of Interfaces, Design of Representation and Information, Design of Data, Design of Discovery, Design of Transformation, Design of Assemblies, Design of Life, Design of Nature, Design of Desire and Demand, and Design of Agency. World-renowned designers, scientists and engineers will contribute with guest lectures. Within a workshop setting, we will design things – material and immaterial; we will learn new computational and fabrication tools along the way; we will develop methodologies for design research of interdisciplinary problems; we will practice what it means to think, live, and breathe Design. The course creates a new pedagogical paradigm for learning and education, which cuts across various disciplines and scales to demonstrate that design is not a discipline, but a way of looking at the world; one that promotes the synthesis of interdisciplinary knowledge across scales in order to create objects and systems for the greater good. This is partly due to the fact that big, real-world challenges – such as the race to cure cancer, the mars landing mission and the challenge to design sustainable cities and buildings – require, perhaps more than ever, an interdisciplinary skill set combined with an ability to operate across multiple scales with creativity. The history of design innovation provides endless examples of cross-disciplinary innovations and individuals. Buckminster Fuller, for instance, was a designer, a futurist, an inventor, an author and a systems theorist. His designs based on the geodesic dome have inspired not only generations of designers, architects, engineers and urban planners but also chemists, material scientists and physicists, who were inspired by his representation of the physical world. Charles and Ray Eames were mid-century American designers working at a range of scales and in a variety of media, from furniture and military aircraft parts to films and exhibitions. Their experiments in design fabrication, and cultural media provide significant references for design education today. An example of the value of learning across disciplines today is found in Siddhartha Mukherjee’s book, Emperor of All Maladies: a Biography of Cancer, which tells the story of how the process of inventing cell dyes to trace the growth of cancerous tissues was actually inspired by textile design. Design has expanded to include a broad range of scales and disciplines, shifting from the production of objects to the design of experiences, data, networks, territories, and social frameworks. Designers are no longer exclusively committed to design autonomous objects (buildings, cars, furniture and household products), but rather are conceiving and testing whole ecologies of design experiences (robotic construction systems, transportation systems, health care experiences, water distribution, and clean energy). This has prompted Tim Brown, CEO of the design consultancy firm IDEO to state, “Design is too important to be left to designers.” The scope of design ecologies is so broad and so integrated with other disciplines that traditionally trained designers are ill equipped to tackle the new breadth of design tasks at hand. Interdisciplinary teams must work together to design the systems, experiences, environments and futures for our increasingly complex world. 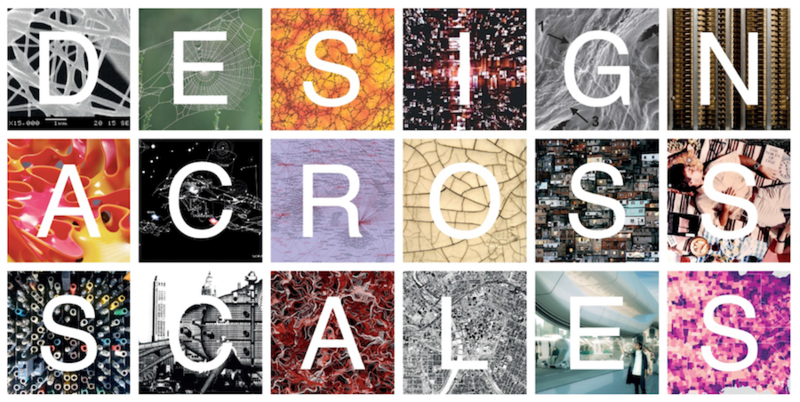 Design Across Scales, Disciplines and Problem Contexts responds to this challenge by creating a course that is not a traditional design course for designers, but a design course about culture, science and technology serving as a foundation course for all students regardless of their major. In addition to one lecture per week by the instructor and guest lecturers, there will be a weekly assignment. Students will be required to select one of three charrette sessions with weekly lab tutorials and workshops to complete the assignment. The readings are highly recommended, particularly for Graduate Students, but not required. Each student is expected to attend all lec- tures, complete weekly assignments, participate in one of three multi-week charrette sessions, and complete assignment.